How to point satellite dish. The North N mark on the rotating part of the compass or the Red end on the needle or the Pointed end of the needle points towards magnetic north. If you stand with the compass in front of you and rotate your entire body and the compass till the North part is directly away from you then you are facing North. North is defined as an azimuth bearing angle of 0 (zero) or 360 degrees. East (approx where the sun rises) is called 90 degrees. South is 180 degrees and West (approx where the sun goes down) is 270 degrees. The compass rose. 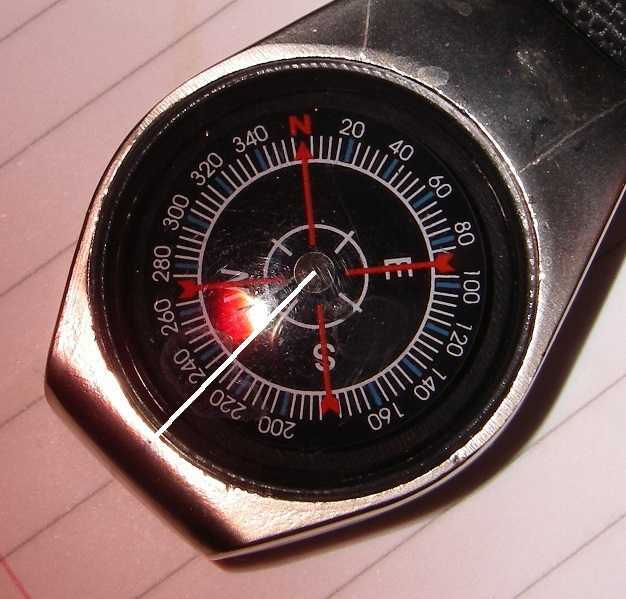 If you held this compass so that the white line was directly away from you and in front of you you would be aimed on a magnetic gearing of 232 deg. The individual tick marks are at 4 deg increments. You are facing half way between south east and south. 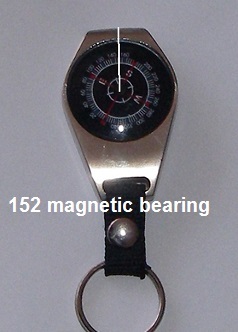 You are looking in the azimuth bearing direction of 152 deg magnetic. You are facing half way between south west and west. You are looking in the azimuth bearing direction of 247 deg magnetic. 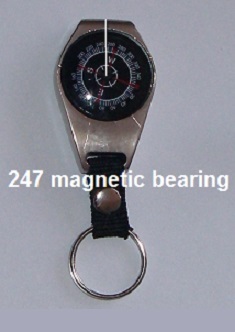 If you want to determine the difference between magnetic bearings and true bearings note that this difference varies according to your location on the earth. If you know your location in terms of latitude and longitude try putting that location into the dish pointing calculator and enter a hypothetical satellite on the same longitude as yourself. The azimuth bearing angle will be 0 or 180 deg true north or true south. The approx equivalent magnetic bearing angle will also be given. This works reasonably well for most locations. My earth's magnetic field model does not extend to the polar regions.